Excellent physics-based summation of why a new investigation is needed. Egregious errors by Zdenek Bazant, and NIST, are also highlighted. Thanks to Steven Jones, Robert Korol, Anthony Szamboti, and Ted Walter for their expertise and undaunted persistence. A lot of physicists will be reading the article. 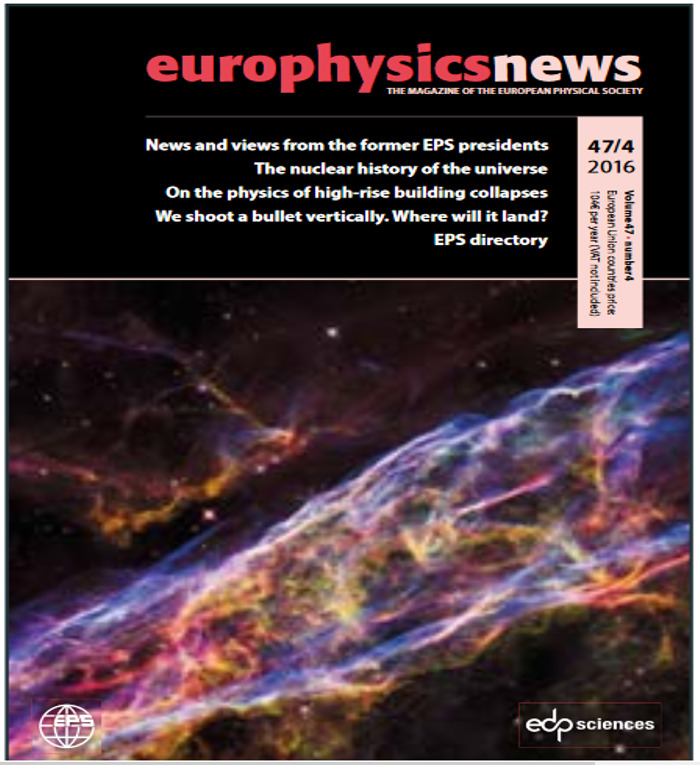 http://www.europhysicsnews.org/ "Europhysics News is the magazine of the European physics community. It is owned by the European Physical Society and produced in cooperation with EDP Sciences. It is distributed to all our Individual Members and many institutional subscribers. Most European national societies receive EPN for further distribution. The total circulation is currently about 25000 copies per issue." Satyakaama on Sat, 08/27/2016 - 3:09am. Thanks for posting this publication reference, kawika! It is exciting to have this paper finally published where it is likely to be read by many physicists and other scientists. The editors took our paper seriously, and have provided a well-read scientific venue. Many thanks to co-authors Robert Korol, Tony Szamboti and Ted Walter along with other supporters! Your comments here - and at EuroPhysicsNews - would be welcomed. ProfJones on Fri, 08/26/2016 - 9:09pm. 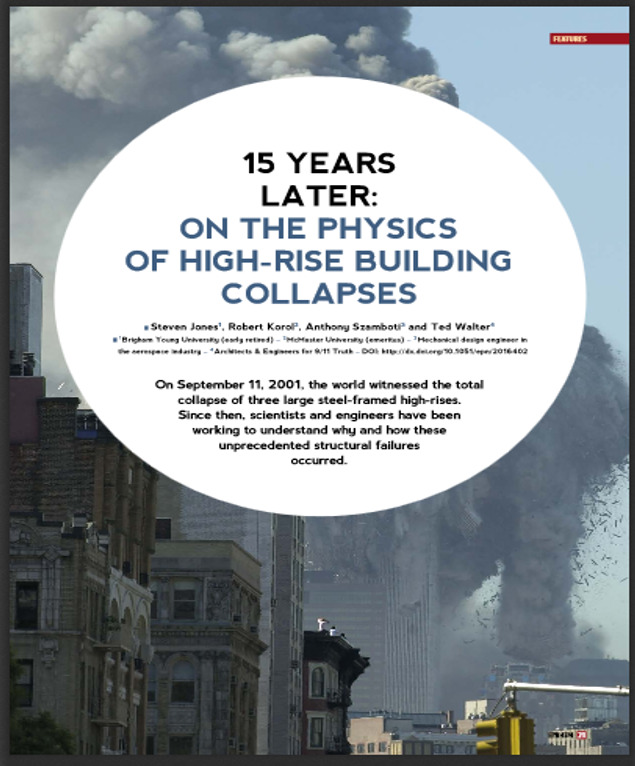 The photo on page 1 shows the collapse of a tower, with a large assembly of exterior panels leading a continuous trail of white smoke/powder (right). How can an assembly with all windows likely blown out, allowing fresh air from below, create this very dense trail? Are we looking at something more than gravity here? kawika on Sat, 08/27/2016 - 9:17am. TomT on Sat, 08/27/2016 - 8:52am. So what's happening with the study by Professor Hulsey and his students at the University of Alaska, Fairbanks? There hasn't been any new updates it seems. Have they abandoned their investigations? what's the status? Thanks to anyone with info. wildbill on Sun, 08/28/2016 - 12:02pm. on Sept. 11, 2016 at the Justice in Focus Symposium in NYC. The public will be able to view it live. I have no other information. Tony Szamboti on Sun, 08/28/2016 - 4:35pm. For all your efforts in this important quest for the real truth. wildbill on Mon, 08/29/2016 - 2:27pm. According to this page, Zdenek Bazant is one of eight editors in chief for the Journal of Engineering Mechanics. This may be more commonly known than I realized; I just recently learned of it. Bazant definitely has some insider power over what gets published, or corrected, at JEM. Satyakaama on Fri, 12/16/2016 - 11:43pm. Europhysics News, the magazine of the European physics community, has now published an article in favor of the controlled demolition theory for WTC 1, 2, and 7. I implore you to get on the correct side of this issue and help end the 9/11 Wars. Satyakaama on Mon, 08/29/2016 - 2:52pm. It's a shame that you appear to have fallen down on the job somewhat and allowed a European science journal, EurophysicsNews, to scoop you on what could be one of the most significant physics related stories for many years to come (and with a special significance for Americans). I am referring to the physics behind the spectacular collapses at close to freefall acceleration (with WTC7 being in actual freefall for 2.25sec) of the 3 WTC towers WTC1, 2 & 7 on 9/11/2001. As a side note, It is interesting that it took a high school physics teacher and a university physics prof to prompt the NIST team of well-credentialed investigators to finally acknowledge that the WTC 7 building did go into a period of freefall after collapse initiation, as they had initially denied that fact while their computer model of the WTC 7 collapse still does not show any period of freefall. 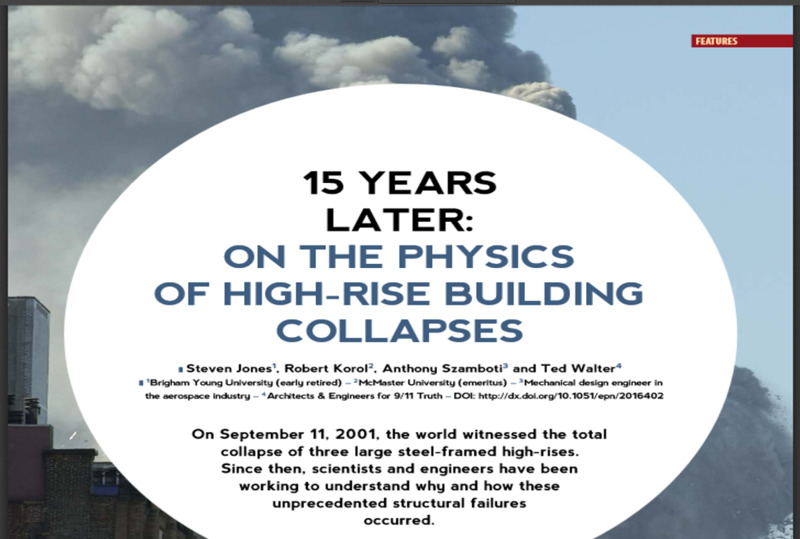 NIST had attributed the three collapses solely to structural failure caused by the 2 aircraft impacts and office fires (although WTC 7 was not struck by an aircraft), while EurophysicsNews presents for their readers an alternate explanation which appears to be more in accord with the principles of physics and with the actual available evidence. stewball on Tue, 08/30/2016 - 9:43am. Excellent Outreach and Independent Action! I love seeing this type of independent action! TomT on Tue, 08/30/2016 - 10:41am. We have had the truth for quite sometime. It just will never be found in the controlled media. I don't suspect it will for the foreseeable future either. The only way this goes down is if people influential step forward together at the same time. It has been proven time and time again that if one person goes out there alone they are smeared and blackballed. I say we pick a day and everyone stand together and demand change to this bogus history. 9/12 is the day we stand together. Jayeats on Wed, 08/31/2016 - 8:59pm. I appreciate the concept of activism on 9/11. It all starts with each of us as an individual willing to take responsibility for our sphere of influence through independent action. Some individuals, although informed about the 9/11 Cover-up, have not yet evolved into taking responsibility to inform others about the 9/11 Cover-up. Do what you can do to inform others. This is where is starts... with the individual himself taking personal responsibility to inform others. TomT on Thu, 09/01/2016 - 4:14pm. Too many people step out alone. It is just not going to get done that way. The same way the lie gets perpetuated by the keepers all playing in sync. That is the same way their house of cards will fall if we beat them at their own game. Jayeats on Fri, 09/02/2016 - 11:58pm. Let it be known that people are doing things. A big failing in the 9/11 Truth Movement is many of the alternative media sites (youtube, blogs, forums, podcasts, writers, websites, etc.) do not promote actions which people are doing. Encourage the alternative media to promote actions. There are alternative media sights that do promote actions. Support them. The Soros mainstream media does promote actions like Black Lives Matter or Occupy Wallstreet. Even mainstream media runs local news stories about people doing things. The visibility brings on the crowds. A few recent successes on the alternative format have been the March Against Monsanto and the VAXXED movement. The VAXXED movement is really growing primarily because individuals promote it, and of course the VAXXED Team promotes the individuals who promote VAXXED. Regardless, it all starts somewhere. It starts with us as individuals. TomT on Sat, 09/03/2016 - 2:05am. Their review seems supportive to our research. ProfJones on Thu, 09/01/2016 - 5:46am. Comments section are a war zone . . . It is remarkable that WND currently has this as the #1 story on their scrolling banner. Great work Prof. Jones and colleagues! JTL on Thu, 09/01/2016 - 7:57am. TomT on Thu, 09/01/2016 - 3:44pm. WND might be somewhat more open to reporting a 9/11 coverup as one of their own columnist, Jack Cashill, has been doggedly working to expose the TWA800 shootdown coverup. stewball on Fri, 09/02/2016 - 10:09am. About ten years ago, WND's periodical Whistleblower featured an "expose" on 9/11 Truth, defending the Official Conspiracy Theory. They have generally been very reticent about considering alternative views—another reason this was such a positive development. It may be a fluke though, as it appears that the story disappeared from the front page by yesterday's end. It didn't even cycle through their scrolling banner the way stories usually do as they get older. Still, we'll take what we can get! On another note, one of their regular columnists Jerome Corsi did briefly wade into into the waters on CD, evidently after some discussions with Prof. Jones. But then he did a complete 180. I suspect Dr. Corsi just felt he had other fish to fry and didn't want to handicap himself at the time, but that's obviously speculation. Time will tell whether WND is waking up and/or acquiring some real courage. JTL on Sat, 09/03/2016 - 9:09am. Tidbits like these help in identifying which alternative media are white hats. ...and it shows us trends. I find it ironic that some alternative media websites are against GMO's and Monsanto, but can't go near World Trade Center Building 7. It is observably obvious that WTC 7 was controlled demolition, but the data on GMOs and their harmful effects takes some intensive research. TomT on Sat, 09/03/2016 - 10:11am. Catte B on Thu, 09/08/2016 - 8:50am. TomT on Wed, 09/14/2016 - 5:02am. Our paper questioning the official US Government story regarding the destruction of the WTC Towers and WTC-building 7 has had over 240,000 full-text views/downloads since 24 August 2016 when it was published in Europhysics News. We understand that the previous record for this journal was about 10,000 full-text downloads. PDF (596.9 KB) "- on the right-hand side of the above link - you can down-load the full-text - and add to the count! PS - thanks, Catte B! ProfJones on Mon, 09/26/2016 - 9:25am. An average of 3200 per day. kawika on Sat, 12/17/2016 - 11:07am. 418,270 downloads in 144 days. An average of 2,904 per day. kawika on Sun, 01/15/2017 - 8:53am. Studies, such as Hulsey's at UAF, will likely generate future spikes. Satyakaama on Thu, 09/14/2017 - 1:08pm.